3 turas eile an seachtain seo - 25km, 25km & 29.5km, i 64 nóiméad, 62 nóiméad & 71 nóiméad. 87.5kg an meáchan atá ionam anois. Sin 6.5kg cailte i Mí Eanáir. Táim sásta le sin. Beidh sé suimiúil a fheiscint céard a chaillfidh mé i Mí Feabhra. Ní dóigh liom gur féidir 6.5kg eile a shilleadh, mar tá teorainn ann i dtaobh cé chomh minic gur féidir liom an bhóthar a bhuaileadh. Trí aistear sa seachtain an teorainn sin. Tá gach sonraí inchurtha agam go OpenOffice Calc ach níl dóthain agam chun cairteanna a tháirgeadh. Is maith an rud é sin, mar níl a leithéid déanta agam le blianta anuas, agus ní cuimhin liom conas é a dhéanamh in aon chur. Nuacht iontach ar bhua éachtach i gcoinne Banríon an Aineolais, a d'fhág rian nimhneach dá oinseachas ina dhiaidh, tar éis briseadh a cumhachta thar óg-scoláirí na tíre cúpla bhliain ó shin. San alt seo ó Éanna Ó Caollaí fógraítear géilleadh na Roinne don fheachtais ar son tumoideachas, a bhí á troid beagnach ón lá ar éisíodh an Ciorclán ainciseach in Iúil 2007. Sin a bhí ann. Leathanach lom aonarach gan chiall gan mhíniú seachas an sean dearcadh tíoránta - "Muidne an Roinn, géilligí dúinn!" Díríodh áird na Roinne ar an dtaighde náisiúnta agus idirnáisiúnta a léirigh gur fearr go mór an tumoideachas ní hamháin chun foghlam an Ghaeilge ach chun máistreacht an Bhéarla chomh maith. Go bhfios dom freisin, ní rinneadar taighde ar bith iad féin chun an chinneadh amaideach a thacú. Is léir nach bhfuil mórán tuiscint ag an Roinn úd ar an mhodh eolaíoch. 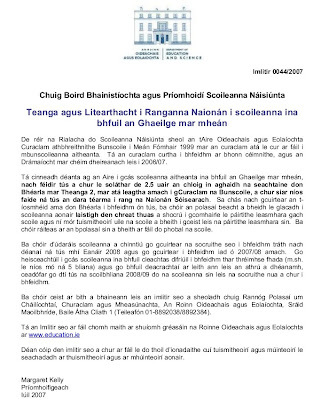 Mo chomhgháirdeachas ó chroí dóibhsean a d'eagraigh an fheachtais, Gaelscoileanna ina measc, agus go háirithe do choistí bhainistíochta an dhá Gaelscoil (Gaelscoil Nás na Ríogh agus Gaelscoil Mhic Easmuinn) a chuir an ceist ós comhair na hArd-Chúirte, chun cúis léinn agus foghlamtha an Ghaeilge a chaomhnú. Maith sibh! Bhuel, treo nua ar aon nós. I ndiaidh lámh trom an stáit a bheith leagtha anuas orm, bhí orm an mhótarbhealach a sheachaint inniú, ach táim sásta go bhfuil an slí mhalartach chomh oiriúnach is a bhí an slí ar a raibh taithí agam air le blianta fada anois. Rinneas 29.5km inniú i 71 nóiméad agus rinneas ar maidin é, ionas go mbéinn in ann an bóthar a scrúdú, ar eagla go bhfuil poill nó a leithéidí ann, nach bhfeicfinn istoíche. Bhí chuile méadar den tseanslí ar eolas agam, sa chaoi is go raibh a fhios agam cén áiteanna a bheadh uisce bailithe i ndiaidh ceatha 7rl. Ní raibh sé fliuch inniú agus is dócha go dtógfaidh sé cúpla mí imeacht i dtaithí daingean ar an aistir nua ach táim sásta ar a laghad go bhfuil dóthan spás ann dom agus nach bhfuil mé i mbaol bás imeacht amach sa dhorchadas. Is léir gur maidin Domhnaigh maidin an rothaíocht, in Ascaill na nGall ar aon nós. Bíonn grúpaí idir bheag agus mhór de dhaoine idir óg agus aosta a gabháil síos an bhóthair, iad uile gléasta ar nós Seán Kelly agus róthair rása mar fhaobhair ag gearradh na gaoithe acu, agus mise ar nós eilifint ar thóir giorria ar bhoinn ramhar mo rothar sléibhe. Caithfidh mé a admháil go gcuireann sé náire orm nuair a bhrostaíonn páistí tharaim chomh tapaidh is a cheapfá nach raibh mé ag gluaiseacht in aon chor. Mo sheacht mhallacht oraibh Bray Wheelers! Tá trí seachtainí den fheachtais nua déanta anois agam, agus ar eagla nach scríobhfaidh mé faoi faic eile tá mé chun postanna na bhlonaige a theorannú go ceann amháin in aghaidh na seachtaine. Aréir, thárla, faoi dheireadh, an rud a bhíodh imní agam faoi ón uair gur athraíodar stadas an seachbhóthair timpeall an bhaile s'againnse go mótarbhealach. Oíche dubhdhorcha a bhí ann, níos fluiche agus níos gaothfar ná an oíche dheireannach. Bhíos fliuch go craiceann sular shroicheas deireadh mo bhóthair féin ach fós ar aghaidh liom. Bhí an ghaoth i m'aghaidh don chéad 10km agus bhíos ag smaoineamh nárbh fhiú an ciorcad iomlán a dhéanamh in aon chor, ach nuair a shroich mé an timpeallán chun filleadh abhaile, dar ndóigh, bhí 10km de ghaoth i m' sheolta romham agus ní fhéadfainn an aistear aoibhinn sin a shéanadh. I ndiaidh cúpla km eile a chuir díom d'airigh mé soilse dathúil na ní-ná taobh thiar dhom. Eisean: What do ye think yer playin' at? Mise: I'm out for an oul' cycle. Eisean: This is a motorway. You can't cycle on a motorway. Mise: But I've been doin' this for years. Eisean: Well you can't do it now. No bicycles on a motorway. Go dtí seo, an meon a bhí agam ná an dearcadh fíor-bhéasach, cáirdiúl fiú, gur gá a bheith agat le Gárdaí, go háirithe nuair atá sé soiléar go bhfuil tú go hiomlán mícheart! Deirfinn ón slí ina raibh sé ag labhairt liomsa nár cheap sé go mbuailfeadh sé riamh arís le duine leath chomh creacáilte 's a bheadh amach ar mótarbhealach ar rothar i lár na hoíche. Ach leis an cheist dheireannach sin, lena raibh an freagra agam cheanna féin (níl comharthaí ar an mbóthar sin ag rá go bhfuil cosc ar rothaí), bhíos beagáinín dána. Is dócha gur bhraith mo dhuine go raibh mé ar déanamh triail ar a dháiríreacht (bhí!) agus láithreach chuir sé a udarás i mo luí. Eisean: Do you know the rules of the road? Géilleadh iomlán a bhí ag teastáil anois, agus sin díreach a rinneas. Mise: Yes, Guard. Fair enough, you're right. Can I go to the next exit? Eisean. Go to the next exit, but if I catch you on here again, you'll be prosecucted. Mise: Fair enough. Thanks Guard. Agus abhaile liom. Táim i gcruachás anois áfach, mar cé gur fíor go bhfuil contúirt áirithe a bheith ar an mótarbhealach, tá an gualainn bhrea leathan ann gan trácht ar bith le cur isteach orm. Má úsáidim cúlbhóithre cúnga beidh i bhfad níos mó baol i gceist, go háirithe i rith an oíche. Dála an scéal, chríochnaigh mé an turas de 23.5km i 61 nóiméad, ach bhí an agallamh beag san áireamh, rud a dhó cúpla nóiméad is cinnte. I ndáiríre, níl an t-am a thógaim ar oíche áirithe róthábhachtach ach amháin go mbeadh dul chun cinn le sonrú. Tá, dar liom, mar is 90kg atá anois ionam. 23.5km i 59 nóiméad a rinneas anocht. Bhí mé fliuch báite faoi dheireadh agus an cuma air gur ag snámh a bhíos! De bharr go raibh sé cuíosach gaothfar nílim ró-bhuartha nár éirigh liom an 57 nóiméad ón oíche roimhe seo a shárú. Sula ndéanaim dearmad air, rinneas 23km aréir i 57 nóiméad. Nuair atá tuilleadh obair déanta agam beidh grafanna agus chuile sórt staitisticí agam chun an dul chun cinn a léiriú, ach níl le déanamh agam anois ach chuile turas a thaifeadadh. Focal álainn úr nua dhom mar bhrontannas ó Aonghus - blonag. Cogair gur chúis mo thiubhas ná ragairne. Maitheasach flaitheasach cróga 's críonna. Táim cinnte go gcabhróidh crónán an mhantra seo liom agus mé ag dreapadh suas cnoic fliucha fuara. Aistear beag eile ar an rothar anocht. 23.5km i 61 nóiméad. Beidh feabhas le feiscint san am sin sna míonna atá le teacht. Laghdú beag sa mheáchan go 92kg freisin. I ndáiríre áfach, seans maith gur an laghdú suantasach (100%) san méid alcól atá á ól agam is cúis le sin, seachas dhá oíche ag tarraingt mo thóin mhór timpeall cúlbhóithre an bhaile! Bhuail sean-chara, nach raibh feicithe againn le blianta fada anuas, isteach aréir orainn gan choinne. D'fhearamar fáilte is fiche roimhe agus chaitheamar ana-oíche ina chuideachta agus ba dheacair an rud é na leannaí a chur chun luí, chomh sceitimíneach is a bhíodar. Ar éirigh dúinn ar maidin bhí an fear úd fós linn agus an cuma air go bhfuil sé ag daingniú faoi. Tá leath-mheangadh anois air, ionann is a rá "beidh brón oraibh sula n-imím uaibh" agus súile dubha aige nach féidir liom breathnú iontú a thuilleadh. Is minic a lean maidin brónach oíche shúgach, nach ea? Chuir mé 18km isteach ar an rothar inniu, mar thús ar fheachtais sláinte na hAthbhliana. 94kg a bhí ionam agus caithfidh mé an uimhir sin a laghdú tapa, ar eagla nach mbeire mé beo an am seo arís! Cuirfidh mé na staitisticí anseo mar spreagadh dhom. Agus cúis magadh daoibhse, dar ndóigh.